Michael Stevenson is pleased to present Shroud, a sculpture by recent Michaelis graduate Katharine Jacobs, in the side gallery series. Jacobs' sculptural installations are responses to the notion of travel, both real and imagined. 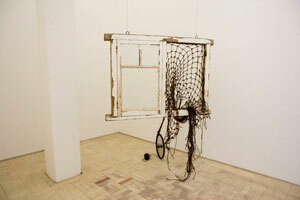 The body of work shown at her graduate exhibition, from which Shroud is taken, was inspired by the story of her grandfather, who spent the last ten years of his life building a yacht in his garage in Zimbabwe. While he was building, his age slowly advanced, his country's economy imploded, its political situation deteriorated and his chances to sail his boat dwindled to nothing. As a nautical term, 'shroud' refers to the ropes or wires that steady the sailing vessel's bowsprit against sway. In the literary realm, Jacobs relates the title to the story of Odysseus' wife, Penelope, in Homer's Odyssey. To keep suitors at bay in Odysseus' absence, Penelope pledges to remarry only once she has finished weaving a shroud for her father-in-law. In order to postpone that moment, she weaves the shroud by day and undoes her work at night. Much like Jacobs' grandfather's building of the yacht, it is a story of one person creating a world for themselves through repeated labour, as a valiant but ultimately doomed defence against an uncontrollable situation. The window frame suspended in the gallery is the meeting point of the inside and outside. Staring through a window may be associated with a longing to travel, but in this instance the view is obscured by thick, hairy netting. The bicycle wheel attached to the netting suggests the possibility of movement, but at the same time is co-opted as spindle, capturing the tension between travel and domesticity. 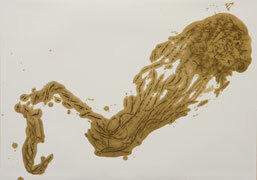 Jacobs was born in Cape Town in 1986, and graduated from UCT in 2008 with a dual fine arts and English degree.